Wouldn’t you love a closet where no sweater, pair of shoes, or pants are out of place? One of the most difficult parts of organizing your closet is getting started. Instead of doing the entire closet all at once, take baby steps. We understand the need to get your closet organized, and we’re here to help! When you start to realize that you have more things in your closet than you need, the things you don’t use anymore start to bother you on multiple levels. Trying to get rid of all of your old clothing and shoes is time consuming and stressful. Fortunately, we’ve come up with some great solutions to getting your closet organized (finally!) and keeping it that way! 1. A bookcase disguised as custom built-in shoe shelves. 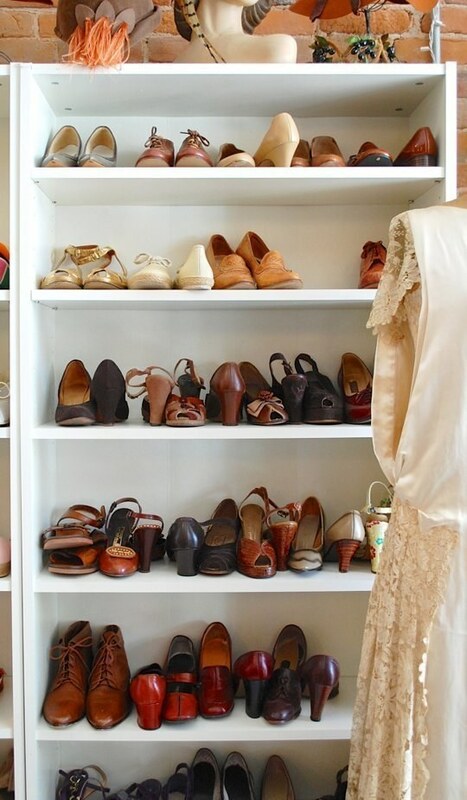 An old bookcase will work great for organizing shoes in your closet. Via BuzzFeed. This is a closet secret weapon that will help you organize your closet like you never thought you could. 2. A row of clothespins can make them easy to find your tights collection. 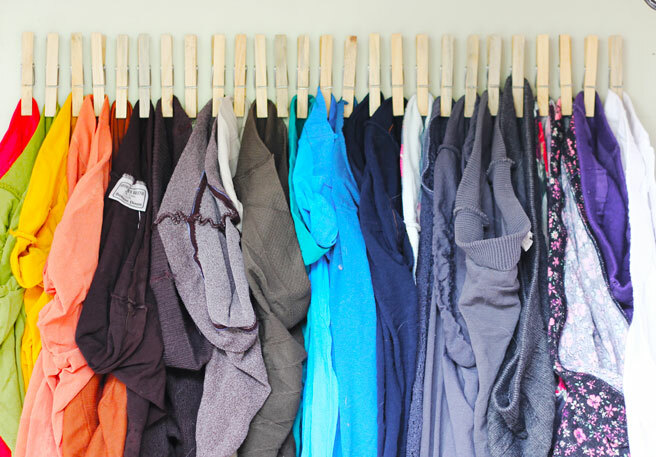 Clothespins will work wonders inside your closet. Via Lana Red Studio. Your tights didn’t fit anywhere in the closet? Here’s a great idea for you. 3. A pull-out belt hanger can work wonders for scarf organization. What about belt hangers to organize your scarves? Via BuzzFeed. 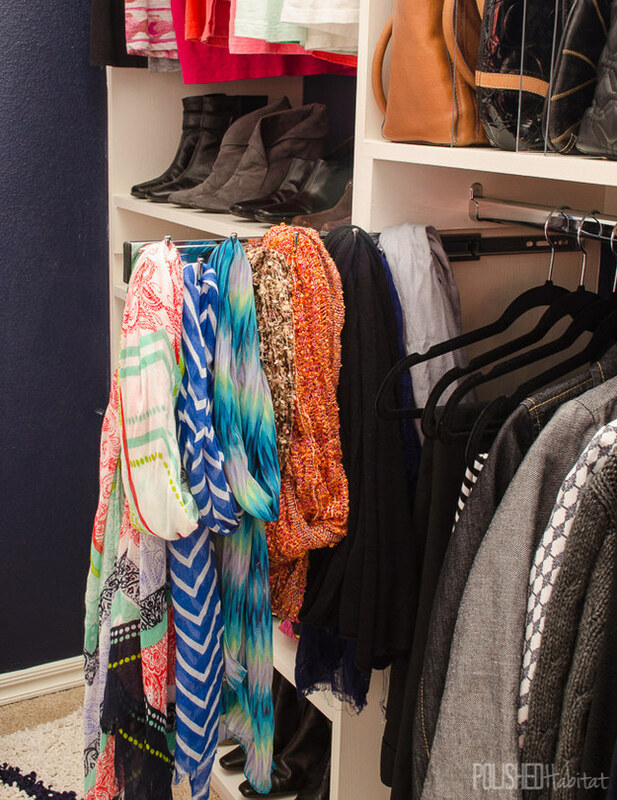 A challenge made easy with our tip on how to have a glam organized closet. 4. 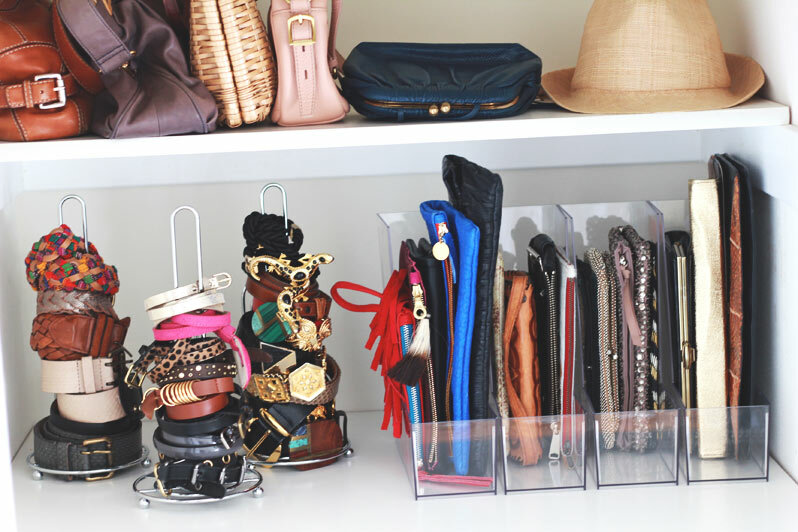 Paper towel holders make good bracelet and belt organizers, and magazine file boxes can keep small leather goods in order. Bracelets, belts and leather goods go in paper towel holders. Via BuzzFeed. Ok, you have a prized collection of jewelry, belts, and clutches. But if you’ve been seriously slacking in the organization of them all, here’s the hint. These other closet organization tips are really useful and we are sure that they will help you hop on the organization train without having to become completely obsessed.